10 May 2017: There is no single pattern of local government in the United Kingdom. Instead arrangements vary in the four ‘home nations’ of England, Wales, Scotland and Northern Ireland. In Scotland, Wales and urban England, with the exception of London, single-tier unitary authorities provide all local services, whereas non-metropolitan England is served by a two-tier system split between district and county councils. During the 1960s, a review established by the Labour government of Harold Wilson recommended the introduction of a unitary pattern of local government across England, though the party’s exit from government in the 1970 election prevented its introduction. The Conservatives had faced internal opposition to the loss of county councils and the government indicated early on that it preferred an evolutionary approach by introducing a comprehensive two-tier system of counties and districts from 1974 in the majority of England and Wales, and metropolitan counties and metropolitan districts in six urban areas of large population density. The metropolitan counties and the Greater London Council were then abolished in 1986, with a further round of unitary local reorganisation taking place in 1996-98. A further round of reorganisation took place in April 2009. There are 27 county councils in England and these cover a further 201 smaller district councils. In addition there are 22 unitary authorities in Wales and 125 in England, mainly serving urban areas. In Scotland, Wales and urban England, with the exception of London, single-tier unitary authorities provide all local services, whereas non-metropolitan England is served by a two-tier system split between district and county councils. The metropolitan districts assumed their current powers and status in 1986 following the abolition of the metropolitan counties alongside which they previously existed. Similarly the London Boroughs and the City of London Corporation assumed their current powers and status following the abolition of the Greater London Council that year. The first 47 unitary authorities in the English shires were created in tranches during the mid to late 1990s following the process undertaken by the 1992 Local Government Act and the Banham review. Under the two-tier system, the lower tier is recognised as districts (or non-metropolitan districts), although some of these may have status as boroughs through old Royal Charters conferred upon them. This also applies to cities, although a number of boroughs have also been converted or upgraded to city status by virtue of having such status conferred upon them more recently. All local authorities have chairmen or mayors as ceremonial/civic figureheads; in some larger and older cities they may be styled Lord Mayor. Where an authority is called a district council it will have a chairman and where the authority is a borough or city council it will have a mayor (or a Lord Mayor). Local government boundaries owe their current basis to local government legislation, though voluntary mergers are permissible under the law and the Local Government Boundary Commission for England is now responsible for the overall examination of local government boundaries and structures. City status accords no extra powers in law and contrary to perception is not related to any single factor such as population size or religious significance, only the existence of a royal edict. Today city status is granted by the Crown acting on the advice of the Prime Minister, usually in connection with a specific event, though historically the decision to confer city status has centred upon the monarch. As we have seen, one of the bedrock Acts governed English local government is the 1972 Local Government Act which introduced the two-tier system across England and Wales of metropolitan and non-metropolitan counties and metropolitan and non-metropolitan districts. For the purposes of local government in England today, counties is generally taken to mean the 34 administrative counties created in 1972 under the Local Government Act of that year. Of course, the English ‘shire’ counties themselves are deeply historical, being of Anglo-Saxon origin as ‘shires’ and the Norman ‘counties’ (as in ruled by a count) and while some historic counties no longer exist in an administrative sense they remain as ceremonial counties, each with their own Lord Lieutenant (as the monarch’s designated local representative). Prior to this, the first administrative counties were created in 1889 and amended only in 1965 (in the case of Greater London) before the introduction of the metropolitan and non-metropolitan counties (see unitary section) in 1974 (as amended in 1985 with the abolition of the metropolitan counties and the creation of the London Boroughs). Each of the 27 remaining non-metropolitan counties (also known as shire counties) has its own elected county council, elected every four years, headed by a leader and cabinet under the 2000 and 2007 local government Acts, with a chairman as its civic figurehead. The primary functions associated with counties are that of education (as local education authorities) and social services, though counties also play key roles in highways, waste disposal public transport, economic development and consumer protection. Counties continue to raise their own local finance through the ‘precept’ levied on billing authorities beneath them at district level. Under the reforms enacted in the mid-1990s as part of the last round of local government reorganisation originally designed to introduce an entirely unitary pattern of local government across Britain, unitary authorities were created between 1995 and 1998 to undertake the roles formerly designated for counties, alongside the roles already undertaken by the districts. Unitary authorities had already existed in Greater London and the six former metropolitan counties in form of metropolitan districts following the abolition of the Greater London Council and the six metropolitan county councils under the 1985 Local Government Act. The Isles of Scilly Council as neither a county nor district but created under the 1972 Act was technically a unitary but a sui generis one at that. The primary difference between metropolitan counties and non-metropolitan counties was that education and social services were the responsibility of the metropolitan districts and in Greater London education was shared between the Inner London Education Authority and the Outer London Boroughs. The new unitary authorities created between 1995 and 1998 resembled their predecessors but are not usually banded with them legally because of the different legislation required to establish them (though they are henceforth known collectively in this article as ‘single-tier authorities’). As such, single-tier authorities currently discharge all services undertaking by councils in the remaining two-tier shire areas and are billing authorities in that they set and collect their own Council Tax. The non-metropolitan districts (which may also be known as boroughs, see sections above) are the sub-county tier which were also introduced in the 1972 Act and have largely remained unaltered, save for those which became unitaries between 1996 and 1998 and in 2009. English districts in shire areas are largely responsible for environmental, waste, housing and planning services. As the successor to the London County Council (1889-1965), the Greater London Council (GLC, 1965-1986) was conceived as a strategic tier of local government covering all-purpose London Boroughs, with some ad hoc joint arrangements in housing and education. Following the abolition of the GLC in 1986, its powers were dispersed between the boroughs (housing all, education in inner London), central government (transport) and some joint arrangements (planning and waste). The resumption of this strategic tier in 2000 following the 1998 referendum which paved its creation, saw the old GLC boundaries observed by the new Greater London Authority (GLA), which did not resemble its predecessor in terms of providing direct services, though the GLC similarly did not enjoy the indirect supervisory powers over the Metropolitan Police and London Fire Brigade that the GLA now does. While the GLC sat as a conventional county style council of 92 seats, headed by a leader and overseen by committees, the governance model of the GLA is split between the office of the directly elected Mayor of London and the 25-member London Assembly which performs scrutiny of the mayor and provides some members of the functional bodies of the ‘GLA family’. The Mayor of London is directly elected for four-year terms by voters across Greater London. The system of election is the Supplementary Vote, where each voter expresses a first and second preference and if no candidate has 50 per cent or more first preferences then the second preferences of all candidates are reallocated to the two highest ranked candidates to determine the winner. The primary role of the mayor is to draft the statutory strategies of the GLA (including the overarching London Plan) and to set the budget for the core GLA and its functional bodies (policing, fire, transport and urban development), as well as appointing members to these bodies. The mayor also appoints a Deputy Mayor from among the 25 members of the London Assembly. The Mayor of London should not be confused with the ancient office of the Lord Mayor of the City of London Corporation. 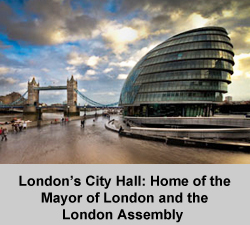 The 25-member London Assembly is elected alongside the mayor for a four year term under the Additional Member System. 14 members represent geographical constituencies based on pairings of London Boroughs while a further 11 are elected from a London-wide list. Parties may replace members from the list in the event of a resignation while the constituency section requires a by-election should this occur. Since 2011, combined authorities consisting of council leaders of constituent local authorities have been introduced to mostly metropolitan areas of England. Among their core responsibilities are transport, economic development, skills, housing investment and spatial planning, with other fields devolved as agreed with central government (e.g. social care, criminal justice). Under the Cities and Local Government Devolution Act 2016, ‘Metro Mayors’ were elected for the first time in 2017 to lead several of these combined authorities, in areas covering Birmingham, Bristol, Liverpool and Manchester, as well as Cambridge/Peterborough and Middlesbrough. The differences between English unitaries and their 32 Scottish counterparts which have existed since 1996 are largely titular, though by dint of the supervision of local government by the devolved Scottish Government and the centuries old separate local government system there are some in relation to powers, duties and nomenclature that are too numerous to list. The role and structure of the 22 Welsh unitary authorities which have also existed since 1996 are identical to the English unitaries, though some style themselves as counties (Powys), county boroughs (Blaenau-Gwent) or joint counties and cities (Cardiff). While they may resemble English unitaries, the 22 councils are under the supervision of the devolved Welsh Government at Cardiff Bay rather than the Department for Communities and Local Government in Whitehall, London. Like Scotland, Northern Ireland has a different legal and constitutional relationship to the rest of the United Kingdom. The province has, since 2015, been divided into 11 council areas, created under 2012 reforms aimed at streamlining the number of local authorities while delegating additional functions (under a decade-long process to decide reorganisation, delayed on several occasions). These replaced the 26 districts created under the 1973 Northern Ireland Constitution Act, following the 1970 Macrory Review. 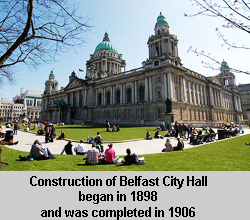 The districts were solely responsible for largely street-scene, community and environmental services, with education, social services and housing administered either by province-wide agencies or nominated joint boards, under the supervision of the Northern Ireland Executive.